A Weatherworks electric roaster can be used to cook a wide variety of foods. You can use it to make turkey, meats, roasts, vegetables, soups and stews. 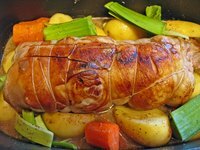 It will bake, steam and slow-cook many foods as well as roast them. The roaster has an electric heating mechanism and a large pan with a lid. A dial controls the heat, and the roaster is easy to use. Roasters can be energy savers and also offer an easy way to cook for a large crowd. Weatherworks makes several roasters. The basic 18-quart model is portable, and the removable pan makes cleanup easy. The temperature controls are easy to use. It is also available in stainless steel. The brushed stainless 18 quart model has digital controls that can be programmed for set cooking times. It also has a window in the lid that can be opened so you can see how your roast is cooking. The roaster is easy to cook with even if you have never made a roast before. Following the instructions that come with the roaster is essential. This will tell you what temperature to use for each item you are cooking. For a turkey or a roast you will want to open the top and baste as well as check how fast it is cooking. Make sure to check the instructions since opening the top will diminish the heat. You may need a slightly higher temperature or longer cooking time, or both. The roaster comes with an instruction manual that tells you about cleaning as well as cooking. The parts are the roasting pan insert, the lid (with steam vents) and a removable meat or turkey rack. When you are finished cooking a turkey or roast, you will want to remove the lid and rack as well as the pan. These can be cleaned by hand with soap and water. Check the instructions before putting any of these parts in a dishwasher. The base of the unit with the heating element cannot go in water under any circumstances.